US Secretary of State Mike Pompeo said the US appreciates Vietnam’s active role in and contributions to regional issues and attaches importance to strengthening the comprehensive partnership with Vietnam. He made the remarks during his meeting with Party General Secretary Nguyen Phu Trong in Ha Noi on July 8. 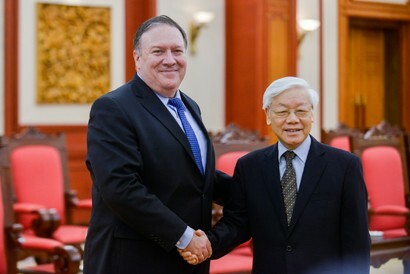 Pompeo, who is on a two-day visit to Vietnam, expressed his pleasure to visit Vietnam for the first time, welcomed effective and diverse outcomes of the two countries’ cooperation across fields. He asserted that the US will continue its assistance for Vietnam to overcome the war consequences, backing ASEAN central role in Indo-Pacific as well as maritime freedom and peaceful settlement of disputes and differences in the East Sea on the basis of international law. The US will also actively accelerate denuclearization process on the Korean peninsula based on the high-level agreements reached during the past time, according to Secretary Pompeo. Meanwhile, Party leader Trong welcomed and spoke highly of the significance of Pompeo’s visit to Vietnam amid good advancements of the bilateral ties recently. The Party chief expressed his belief that the visit will help boost the implementation of the two countries’ high-level agreements, asking both sides to continue stepping up delegation exchanges at all levels. Both countries should continue improving the effectiveness of cooperation across fields, including enhanced cooperation in overcoming the war consequences in order to contribute to mutual trust and understanding, said Trong. Party leader Trong reaffirmed Vietnam’s consistent policy of treasuring the relationship with the US, expressing his belief that the Vietnam-US ties will continue thriving in the future for the benefits of the two people and for peace, stability and development in the region and the world.